In the digital age, the implications of financial crime against banks and other financial services institutions is accelerating rapidly. Fraud prevention now represents one of the biggest areas of concern for the financial services industry and is likely to become one of the largest drivers of IT expenditure in the coming years. Forward thinking banks are evolving their fraud management systems from a level of standalone basic detection to one of enterprise predictive risk assessment, integrating big data, advanced analytics, and real time functionality as well as customer experience. 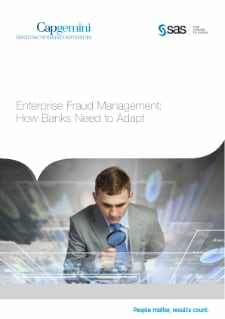 This document, produced by Capgemini and SAS, outlines the five emerging trends in fraud management underpinning the new fraud detection solutions. Capgemini and SAS have entered into a partnership to help banks review their fraud-control practices and achieve their objectives. With 145,000 people in over 40 countries, Capgemini is one of the world’s foremost providers of consulting, technology and outsourcing services. The Group reported 2014 global revenues of EUR 10.573 billion. Together with its clients, Capgemini creates and delivers business and technology solutions that fit their needs and drive the results they want. A deeply multicultural organization, Capgemini has developed its own way of working, the Collaborative Business Experience™, and draws on Rightshore®, its worldwide delivery model.